I recently had to replace the battery on my personal ride. It was time. The original gel cel, lead acid type battery that came with the BMW was just over 6 years old and I was surprised it lasted as long as it did. I attribute it's long life to constant use. Sitting around, slowly discharging is hard on a battery of most types and my bike doesn't do much "sitting around." When shopping around for a new one, I looked up the type and size and started checking around. One option I found, was one of the new Lithium Ion type. This is the newest, yet tried technology for auto/motorcycles and I couldn't find any downside to using one. 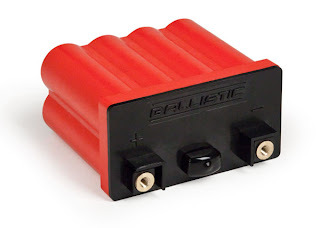 After deciding that it would work in my bike, I went down to my local shop of choice (Kinetic Playground) and ordered up an 8 cell EVO2 Ballistic battery to fit. When it came in the next day, I was very happy with the choice. The original BMW battery that came out weighed in at 9.76 lbs, with the specs of 14 A/H and had 200 CCA. It is carried fairly high, behind the engine and underneath the seat. This location is typical with most, but not all. The specs for the Lithium Ion replacement I was installing are; 1.6 lbs, 15 A/H and 275 CCA and about half the size of the original. Installation of the smaller battery was easy enough. It isn't a drop in install, but did require a little shimming with the foam that came in the box, to get it secured in the original location. Simple enough and only took a couple minutes more to get it done. Of course, this is a dry cell battery and can be mounted in any position. This gives you the option to mount it in another location that is better suited to weight distribution for your bike, if you want to get creative. The advantages of this new battery are the longer "sit time" and the weight savings. This type of battery will lose less than 10% of it's charge in a year's time. That means that if you live in colder climates and your bike ends up sitting in the garage all winter, you don't have to worry about hooking up a battery tender. No maintenance charger, no worry. You can use one, as long as it falls in line with the specs given, but I'm not ever seeing a need for it unless your bike is sitting for years at a time and then what's the point in having one? And the biggest advantage to me, is the weight difference. In my application, I saved just over 8 lbs by just switching the battery. That is a tremendous amount per dollar when compared to spending real money on carbon fiber replacement parts, new exhaust system, etc. 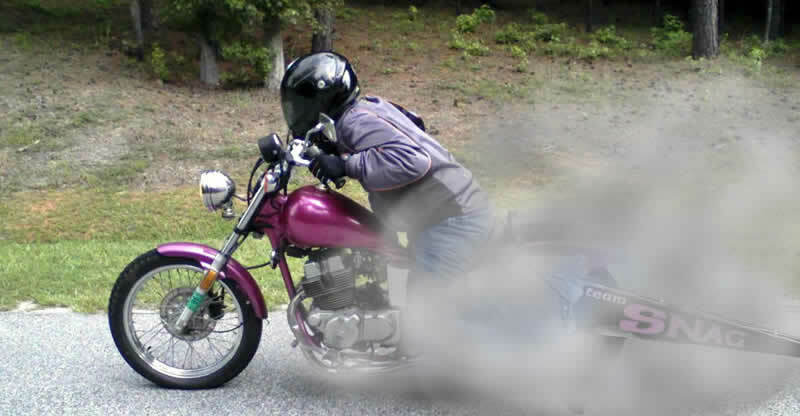 It is typically regarded on the average motorcycle, that 7 lbs lost = 1 hp. So, if you think of it that way, I gained just over 1hp, by just switching to a lighter battery. It's going to take a lot more work than that to turn your Rebel 250 into a dragbike, but it will help. There was a small cost difference between the stock replacement and the new Lithium Ion, but when you get higher cranking amps, ability to sit for long periods without a worry of discharge, smaller size and a fraction of the weight... It's an easy choice.